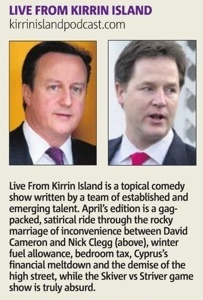 Live from Kirrin Island is a topical comedy podcast and show brought to you by a selection of writers from the British Comedy Guide. 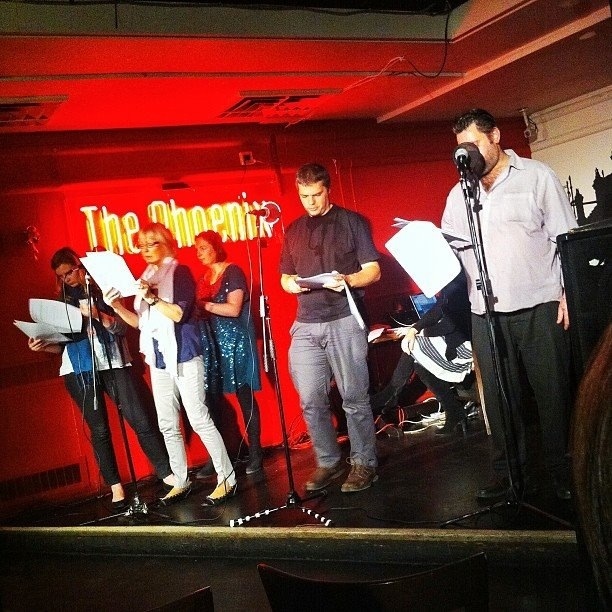 The team comprises commissioned and non-commissioned writers for BBC radio comedy shows including Newsjack and Recorded for Training Purposes and have an array of credits between them. It was first broadcast on Brooklands Radio in June 2012. Shortly after launch it became a Top20 comedy podcast on iTunes where you can download it and subscribe, or you can search any podcatcher for “kirrin island” to download the Kirrin Island comedy podcast via other means. 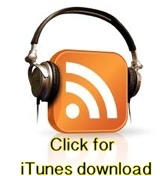 Alternatively you can stream the episodes live from this website from THE PODCASTS page. In 2013, we’ve been shortlisted in the top 3 entertainment podcasts for the British Public Radio awards, entered into the Sony Radio Academy awards, and secured a Top20 place in the European Podcast Awards. No one knows exactly where Kirrin Island is. It was once the scene of many jolly japes for the Famous Five (whose ginger beer-fuelled mayhem would these days be ASBOd). Now home to the same types of people as the rest of the UK, with the added bonus of an island mentality and a disconcertingly concentrated gene pool. It has radio and TV stations, a dysfunctional council (a coalition, of course), shops and businesses, a mafia and even its very own social media billionaire. Explore the island with the map above to hear the characters – and then download the show. The BBC have been following our progress and have described Live from Kirrin Island as “the kind of forward-thinking project we believe everyone should know about, and take inspiration from“. You can find links to a guest blog and hear us being interviewed by the BBC below. THE METRO: 1st May 2013: And we were delighted to be featured in The Metro newspaper.